What are the Top 5 Reasons to Keep Your Car Clean? According to a study done by the Harvard Health Watch, the average American spends 101 minutes per day driving. That means that in a lifetime, an average Joe spends a whopping 37,935 hours driving a car (assuming that s/he starts driving at 17 and drives until 78.7 years old). That is nearly 2 hours a day spent in a vehicle for the average American. If you’re driving around in a germ infested vehicle, it could be harmful to not only you but also people you care about. Getting your vehicle professionally detailed and keeping up with regular cleanings will drastically reduce the harmful germs that could be getting comfortable in your vehicle. If you want to clean it yourself that is definitely an option. I would suggest getting a carefully sought out professional detail. With the healthy and productive mix of proper training, effective but safe chemicals, and high-powered and hard-hitting equipment, most harmful germs will be eliminated. Not just covered up, but removed from the car completely. This is probably the main reason people want to get their car detailed. It’s always been my belief that a clean car runs better. I’m not going to tell you whether that’s completely true or not. You have the information now so do with it what you must. Having a nice and clean looking car does a lot for piece of mind and confidence. It’s like all those studies that tell you how successful people make their beds everyday. Having a car that you take care of and clean will not just be beneficial to the car but to you personally. It will also eliminate embarrassment. If you’ve ever been criticized or self-conscience about how dirty your car is you know what I’m talking about, you know who you are. I think everyone at one time or another has had to deal with that. I don’t know what would be worse… an dirty appearance or an unpleasant odor. Appearances can be changed but odors and smells can be a little tougher to eliminate. Especially the longer you wait to try and take care of them. A story about a bad car smell that happened to me personally, er…I mean, a friend of mine… My friend had bought a gallon of chocolate milk for a get-together at a friend’s house and had taken everything into the house except the chocolate milk, which had been locked in the trunk. Weeks went by and a smell started to become worse as the days went by. Keep in mind this is the middle of the summer. 3 to 4 weeks later my friend opened his trunk and was met with the harsh reality of his brief stupidity. By that time, rotting milk had expanded and soaked the carpet of the trunk and the smell had nearly been absorbed into all the fabric of the car. Some good things came from this experience. One of them is that my friend hasn’t done anything that dumb since then but also learned that a good detail job can eliminate smells. Smells (or the bacteria causing the odors) can be extracted from fabrics and carpet if smells haven’t had much time settle into the material. There are other odor removal products such as Odor Bombs or ozone machines as well that help get into every crack and crevice of the vehicle to kill and eliminate the cause of the odor as opposed to just masking it with a fragrance. Smokers cars are the toughest but it CAN BE DONE. In some cases it can be a 3 to 4 days process but it can be done through a combination of the mentioned processes. If you talk to any good realtor, they will tell you that a house and yard that have been taken care of, flipped, or updated, has a much better chance of selling at a good price than a house that hasn’t been. They will also tell you that putting a couple thousand into the landscaping, yard, or a renovating/flipping project inside the house will increase the value by a few thousand more. In some cases can increase the value by tens of thousands. Putting effort into taking care of things and places that are a big part of your life will pay off in the long run. Namely your house and your car. Although you’ll also need to keep up with oil changes and many mechanical issues that may arise with your vehicle. Keeping it clean will add the appeal and also tell people that if you’ve taken care of the cleanliness of your car, you’ve most likely taken care of the mechanical things that aren’t as visual. Keeping up with the smell and appearance will make selling your vehicle a piece of cake when that time comes. This one speaks for itself. 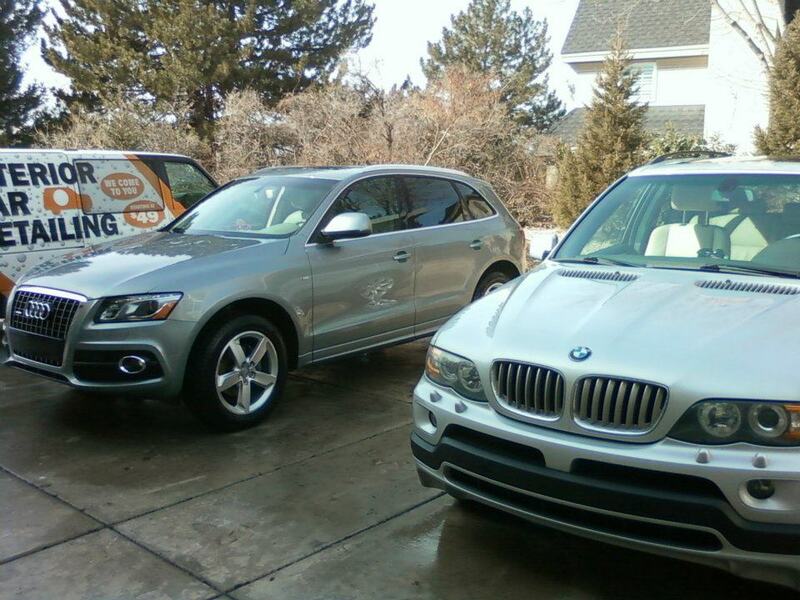 It can be difficult to find the time and money to detail and maintain cleanliness with your vehicle. Especially if it’s a family vehicle. Family vehicles will usually be bigger and be more expensive to detail. Minivans, SUVs, mid-sized SUVs, large trucks, etc. My wife and I have a small SUV that is her car but it is our road trip car. Also the car that we run errands in. My wife also uses it for work daily driving anywhere from 1 to 3 hours a day. We also have a newborn and a dog that minimally sheds. It’s not as much of a challenge for us as it will be eventually but that’s the vehicle we really try to keep up on with mechanical and detailing. As much of a challenge as that can be, it is extremely rewarding to have the vehicle that we spend all of our time on the road together in, is clean and runs well. Some surveys suggest that a clean car makes us feel happier and three out of four drivers say a spotless car makes them feel better about themselves. If this is true then why would you not want those you care about to have a freshly detailed car as often as possible? For those of you that struggle buying gifts or have someone that is tough to buy gifts for, we sell gift certificates. Anyone will appreciate a clean vehicle as a gift. Whether you want to pay for a whole service or a portion of a service, we can help you out. We sell them year round and the holidays are always a good time of year to buy them. Let us know how we can help you.